Overwhelmed. Ashamed. Frustrated. All of that stops today. Getting organized in 5 simple steps can happen for you, even if you’ve failed at getting organized before. Author Darla DeMorrow is a Certified Professional Organizer who helps people worth through these simple steps every day to have more organized homes and more peaceful lives. This little book is easy to read in about an hour. That’s right, just an hour. You’ve probably spent longer than that just complaining about your clutter over the last week. Well, that ends today. You can be organized, too. You also get access to free downloads and a free clutter-free support group, where you can find ongoing support from people just like you, around the globe. Reviewers state that they read this book and were able to immediately organize their space. They were looking forward to organizing even more the next day. They claim this is the book that finally seemed do-able for them. They even claim to want to read this book again and again. No one wants you to succeed more than this author. Start here and celebrate your success. 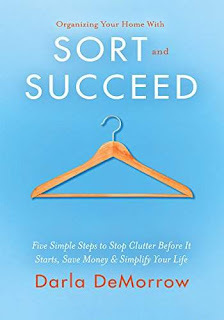 Come back for additional titles in this series, including Organizing Your Finances with SORT and SUCCEED, due out in 2018. DeMorrow is a 13 year professional organizing veteran, member of the National Association for Productivity and Organizing Professionals, a designer, and a Certified Photo Organizer. She’s been quoted in Money Magazine, Good Housekeeping, Realtor.com, The Kitchn, US News and World Report, Forbes Online, and many more. With this little book, you’ll find specific steps for your situation. Start your organizing success here and now.